Firebug 1.10 has been released and so, let’s see what new features are introduced in this version. Firebug installation doesn’t require browser restart. Install, press F12 and Firebug is immediately ready at your fingertips. If you are updating the previous 1.9 version that require restart you need to restart the browser. Firebug doesn’t slow down Firefox start-up time anymore! It’s loaded as soon as the user actually needs it for the first time. Only the Firebug start-button and menu is loaded at the start up time. Firebug allows to view and manage cookies in your browser. You can deny cookies for specific sites, filter cookies, create new and delete existing cookies. You can also break into the debugger when specific cookie changes its value and see the line of script that caused the change. And much more! Check out full list of cookie related features. Command editor (aka multiline command line) supports syntax highlighting. 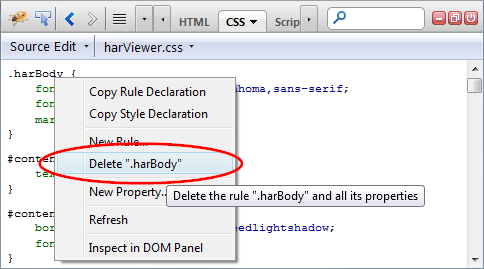 Autocompletion in Firebug has never been better. This feature helps you when editing CSS properties, variables in the Watch panel, break-point conditions, any numbers, colors, font-families, etc. Just try to edit your page through Firebug UI and you’ll see for yourself. Check out the screenshot. When typing into the Watch panel, the autocompletion offers variables in the current scope. This feature allows tracing all places which affected specific CSS property. The feature is part of the Computed side panel where every CSS property is expandable. The Computed side panel also supports tooltips for colors, images and fonts. See, there are three places trying to set the font-size of the selected element (the one in black succeeded). Of course, the blue text/location on the right is click-able and navigates the user the right place. See also detailed explanation. If you are interested what built-in commands are actually available in the Command Line (within the Console panel) just type: help. You’ll see a list of commands with a description. The green command name is a link navigating the user to Firebug wiki with more info (and how-to-examples) about clicked command. 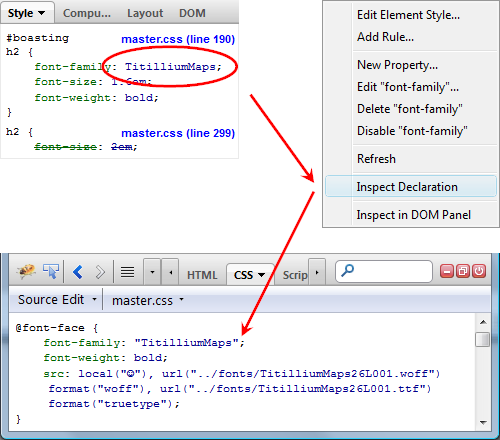 This feature allows to quickly inspect custom font-family declarations. All you need to do is to right-click on your font-family value, pick Inspect Declaration and you’ll be automatically navigated to the CSS panel that shows the place where the font-family is declared. Check out the screenshot below. Media queries of @import CSS rules are displayed inside the CSS panel and it’s possible to edit them. Of course, auto-completion works in this case too (e.g. when I did the screenshot, I clicked on 400px value and pressed up-arrow, that’s why there is 401px). 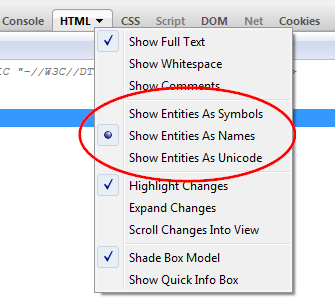 There are new options in the HTML panel that allow changing displayed format of HTML entities. And by the way, MathML entities are also supported. There are also new options allowing to change displayed format of CSS colors. Firebug offers three options: Hex, RGB and HSL. These options are available in CSS, Style and Computed panels. This is one of many little and neat improvements. Every menu item has also a tooltip that explains the associated action. It’s especially useful for options. 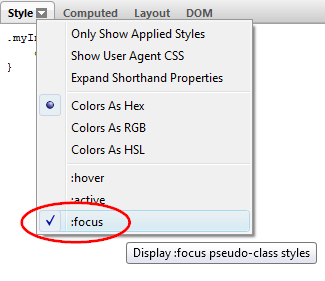 Apart from hover and active CSS pseudo classes, Firebug is also supporting: focus. This feature helps in situations where you want to inspect CSS rules that applies only if the inspected element has focus. Here is what you need to do. Firebug Net panel is able to display also HTTP requests coming from so called BFCache (Back-Forward Cache). This cache makes backward and forward navigation between visited pages very fast. Note that this has nothing to do with the browser cache. Check out the screenshot, we changed the background for requests coming from the BFCache and so they can be easily differentiated from other requests. Only the last request on the screenshot is coming from the server. In order to see those requests you need to check Show BFCache Responses option. Check out our issue tracker for all 79 enhancements in Firebug 1.10. Also, follow us on Twitter to be updated about upcoming Firebug news! +1 million for the Trace Styles feature! Been hoping for that for a long time! Great job on all of these actually. Thank you! wooohoo! love the new features..
Auto-completion for the Command Editor is already planned. A must have tool these days. Firebug is the best thing to ever happen to web design. Thanks for all your hard work. Thanks for a big update. Why the syntax highlighting is not used also in the Scripts panel? I’ve used FireRainbow but it causes crashes so I had to disable it. Syntax highlighting for the Script panel is planned. Thanks Guy for hard working ! Keep up the works. Firebug is a must ! So awesome – been waiting for this update for a long time! Well done firebug team. It’s an awesome app and very useful. If you get to Linux.conf.au, look out for me, I’ll shout the pizzas or beer! Thanks for the effort. It is stellar. Is there any way to open Firebug, by default without delay? This new feature is slowing down my develop / test cycle. Thank you. That works and is a good development setting. Absolutely outstanding job, especially considering Mozill’a morose decision to re-write the wheel. Or shall we say Macify the wheel just for the sake of it? Imagine what could be achieved if Mozilla had sensible leadership! I guess there is some cross pollination such as the new shared JS debugger and inspector engine (AFAIK?) but really, Firebug is so good, there’s no need for the ‘native’ devtools, especially since the Hueyfix is such an enormous bonus to Firebug performance. Let’s just bundle Firebug with Firefox by default and stop splintering resources into two different developer tools teams. It’s ridiculous! example code: page is seen in 153,191,but with Firebug1.10 to see is 153.19，but I use Firebug1.9.2 without any problems. why? Please, create an issue report here: http://code.google.com/p/fbug/issues/list so, it isn’t lost here among comments. Cookie management and syntax highlighting FTW. Great job! Thank you so much for your awesome work, however, one minor complaint. The gray color used for autocompletion is way too light. I can barely see it on my monitor from a normal viewing distance. Please create an issue report so, it isn’t forgotten here. The announcement says that the new version of Firebug only works with FF 13 and update. This would seem to imply that it doesn’t work in the current Firefox ESR release (FF 10). Is that possible? That would seem like a big oversight. ESR gets only security and stability updates, not new features. That’s the trade-off of ESR. Release notes for the current ESR update are at https://www.mozilla.org/en-US/firefox/10.0.6/releasenotes/ I assume that Firebug 1.10 requires Firefox 13 because it depends on specific new features in Firefox 13 that ESR 10 doesn’t have. You can use ESR 10 with Firebug 1.9. Thanks for the explanation, it’s exactly correct. Is there any way to turn syntax highlighting off? (Or at least, a part of it.) The boxes around pairs of braces are extremely visually noisy when developing in FB, aarg! Please put your comments about http://code.google.com/p/fbug/issues/detail?id=5705 into that issue. It’s not necessary to also post here. A fantastic range of updates, especially trace styles. Webkit’s dev tools are certainly respectable, but they still can’t touch Firebug, and with these new features, Webkit has even more catching up to do. Just gotta convince my colleagues of this :-). Thank you for making my job so much easier! Fantastic new features… you guys rock !!! Please create a bug report here http://code.google.com/p/fbug/issues/list plus detailed instructions how to reproduce the problem and we’ll fix it, thanks! Filed issue 5790, let me know if I can provide anything else. nonneophyte posted a followup on this at https://groups.google.com/forum/#!topic/firebug/qLgaqVTA0Po. Thank you for the great work, this extension has helped me a lot. I have noticed that whenever I run firefox and firebug for a long time the browser slows down when refreshing the page, if I then disable firebug and do a refresh everything works as expected, is this normal?, also I have noticed a huge drain in memory when using firebug. Try to run Firebug with Firefox 15 (currently beta) and let us know if the memory problems still persist. Just noticed that this might actually have to do with my computer, nvidia had installed a plugin called 3D vision I guess when I installed the driver and also there was 3 plugins from ms office. The fan was running on my computer non stop whenever I ran firefox with firebug but by disabling those plugins (both nvidia and ms office) the fan stopped immediately and there seems to be no more memory leaks. I will re enable the ms office and test if that was the problem and then test with nvidia and let you know! Just so you know this only happen when both firefox was running and the firebug panels were enabled although disabling those plugins seem to have fixed the problem. Hi, I’m using firebug for few years now and very appreciate your work. Today, suddenly feature of live previewing current net requests disappeared. I can see new requests only when I change tab to another and back to net. Is it a feature? Were can I turn it on again? and let us know if the problem persist. I don’t know whether firebug extension in my firefox 15.x browser has bug. I cannot using it in right way. I have to disable and then enable to use it. But when I update to firefox 16.x, it works like normal. Does it still happen if you upgrade to Firebug 1.10.6? The problem doesn’t happen to the new Firebug 1.10.6 with Firefox 16.0.2.